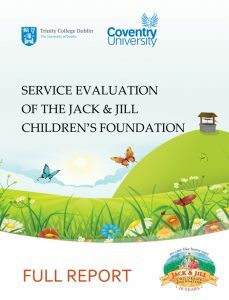 On foot of recommendations from a service evaluation report from Coventry University and Trinity College launched today (Wednesday 15th November 2017) at the Royal College of Physicians of Ireland, the Jack & Jill Children’s Foundation is to extend the age range of children supported by the charity. This age extension, announced by Jack & Jill CEO Hugo Jellett, is effective immediately and broadens the charity service from supporting children from birth to 4 years of age, to supporting children from birth to 5 years of age. Key recommendations in the report, which is published on jackandjill.ie, include an extension of the age limit for Jack & Jill to 6 years of age; new ways of supporting parents through social media and support groups; government funding to provide 24-hour home nursing care for children who require end of life care; and access to more support and supervision for the wider nursing and carer team supporting families. The duration for the work was 12 months from inception to final report, with data captured via questionnaires, focus groups and meetings in Cork, Dublin, Kildare, Limerick and Galway, involving 272 participants made up of parents, health and social care professionals and nurses. According to the report, “The role of the Specialist Liaison Nurse encompasses problem solving and liaising with hospitals, physicians, pharmacists, HSE, public health nurses, disability services, charities and suppliers. Their role incorporates assessing the home environment and establishing what resources are required and ensuring that the hands-on care is in place to support the child and family. They are seen as enablers and every caseload requires assessment and careful planning.” What is also evident through the report is the disparity between rural and urban locations and how geography determines the availability of specialist health services and skilled experienced staff. Throughout the focus groups there was strong sense that the Specialist Liaison Nurse advocated for the child and families especially when navigating relationships with other health and social care professionals. The Jack & Jill Children’s Foundation has had a longstanding battle with the HSE regarding the sanction of medical cards for children with life limiting conditions requiring care at home. The Foundation has, through the voice of Jonathan Irwin and others, been instrumental in the changing landscape of the entitlement of medical cards for children receiving domiciliary care allowance. Medical cards are now automatically sanctioned to children in receipt of domiciliary care allowance.